Designed using three complementary woods, this personalized hardwood pen box set is a clever storage and display case for pens. The maple wood box holds two rosewood pens. The walnut wood cap with magnetic closure doubles as a stand to turn the pen box into a one-of-a-kind, desktop display. 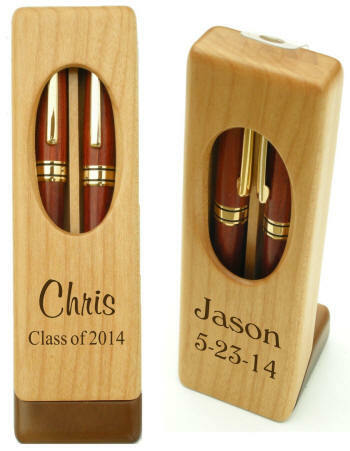 This hardwood pen set with hardwood case can be laser etched on case, pens or both for a welcome Graduation gift or gift for many gift giving occasions. $5.00 to personalize both pens.